This delicious Greek casserole, pronounced as “pahs-tee’-choh” (or “pahs-teet’-see-oh” in Italian (4)), resembles lasagna, but is seasoned differently, and is made with a tube pasta, instead of flat lasagne pasta. It is also similar to another Greek casserole, Moussaka, but a bit quicker to prepare. The traditional pasta for this dish is called Mezzani, but I have difficulty finding that. So I use mostaccioli, penne, ziti or sprouted grain versions of these (such as Ezekiel brand); I describe these below. Or quinoa penne if you want it to be gluten-free. Macaroni would also be acceptable in a pinch, but do not overcook it. I provide 3 different baking pan-sized versions: 9″ x 13″ to serve 8 – 10; 9″ square pan to serve 6 – 8; and 6″ x 8″ to serve 3 – 4. I make the smallest size because I have a lid that seals for that pan, to save left-overs. Excellent served with Horiatiki (Greek Village Salad), Spinach Pie, Pickled Beets, and a glass of Retsina wine. Duram, a hard wheat, is the grain most commonly used for making pasta, as it is highest in protein; traditionally, semolina from durum wheat is used for pasta. However, as a highly hybridized grain, it comes with significant problems for human health due to the increased protein content, namely: gluten (in both whole grain flour and processed white flour like semolina) and WGA lectin (only in whole grain flour). For more on both of these proteins, see my article on Sprouted Grain & Sprouted Grain Flour (About), which discusses the problem of gluten and lectins in grains, and how eating sprouted-grain or sourdough bread resolves the gluten/lectin problem. In fact, sprouting or fermenting (sourdough) the grain is how the Biblical people were able to eat bread to sustain their health and life; this is the bread that Jesus shared with his disciples at the Last Supper. Humans only gave up sprouting or fermenting their grain in the late 1800s. 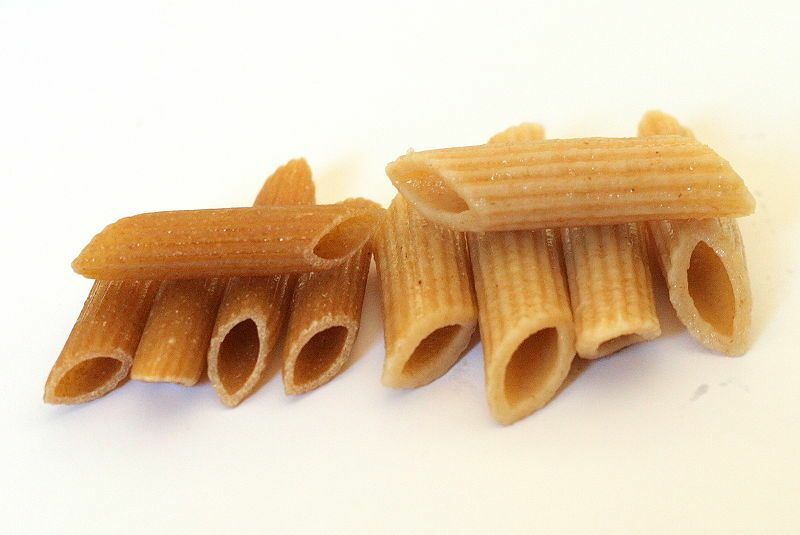 If you have gluten, blood sugar and/or weight issues, you would be wise to avoid pasta made from wheat (unless it is sprouted wheat); see Pasta (About) for more. Or make your own pasta from sprouted grain/flour. Another option is to use Potato Gnocchi (made with a non-wheat or gluten-free flour and potatoes). 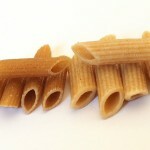 Penne is easiest to find in whole wheat or gluten-free versions. 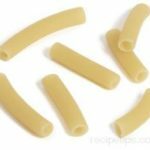 Measuring dry pasta: is very hard to get an accurate measurement using cups as in the Best Friends Cookbook recipe, so I looked for a recipe that measures pasta by weight. The original gram-weights for the pasta are based on a Pastitsio recipe on My Greek Dish (5); I’ve since updated them per my testing of the half-recipe (6″ x 8″ pan size) as a range, not only for pasta but also for tomato sauce and tomato paste. Lamb is the most authentic (you’ll find sheep grazing on the rocky, hilly ground throughout Greece), but you could use any other ground red meat, such as beef, buffalo, yak, or wild game; or a mix of lamb and beef. I would not recommend pork or ground turkey. Sprouted- or whole-grain penne works great in this dish. The amount of these ingredients are related to the amount of pasta used; I present these amounts as a range. If you use the low-end of weight of pasta, then use low-end of tomato sauce and paste. Ideally you would use the Greek cheese Kefalotyri for the pasta and béchamel layers, but it can be hard to find. The best alternative is Parmesan or Romano cheese. Alternately, for the pasta layer you could use crumbled feta cheese. 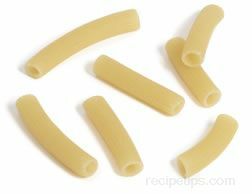 In the pasta layer: milk is used in the original Best Friends recipe, but you could use cream or a mix, or skip it altogether. In the béchamel layer, milk is essential. I’ve never tried using a nut or seed milk for this, but you could try almond milk. Béchamel: I include a béchamel sauce recipe here, but you could use Béchamel Sauce, with Egg, plus added Parmesan or Romano cheese as in the instructions below. In the late 1970’s – 80’s, I used to eat many dinners at NW Portland’s Souvlaki Stop – a family-owned Greek restaurant down the street from my house and near my bus stop; they made most of their foods from scratch. One of my favorite dishes there was Pasticho (that’s how they spelled it), made with pasta, lamb, tomato sauce and topped with béchamel sauce. The lamb and tomato sauce were seasoned with cinnamon and nutmeg, which gave it a distinctly Greek flavor – setting it apart from Italian lasagna which is seasoned with the more familiar basil and oregano. This version is adapted from Best Friends, Etc. cookbook, and my memory of the Souvlaki Stop’s version.The original recipe serves 8 – 10 (using a 9″ x 13″ baking pan). I’ve since added a smaller version (9″ square pan) to serve 6 – 8 in parenthesis, and a separate half-recipe (6″ x 8″ pan) to serve 4 – 5. Each size is designed to provide 7 – 9.5 grams of protein/serving (from the lamb). I also use recipes on My Greek Dish (5) and The Spruce (6) for tips. There is a fair amount of prep work: making the tomato sauce with lamb, making the pasta with cheese sauce, and making the béchamel sauce. But once you get it all put together, you just wait 45 – 60 minutes for it to bake. See also below for a vegetarian adaptation, using lentils and eggplant, or for a variation with spinach. NOTE: Per my testing for the smaller 6″x8″ pan size (see below), I’ve made the following amount updates in ranges (but I’ve not yet tested these larger recipe sizes): Pasta: Lower amount (in red) is based on my updated 6″x8″ pan size (see below); higher amount is based on the My Greek Dish (5) recipe. Tomato sauce: Lower amount (in black) is based on the original recipe and higher amount (in red) is based on my updated 6″x8″ pan size. However, I’ve not yet tested these larger sizes, so I recommend that for the tomato sauce, start with the lower measurement. You can always add more. as updated per Oct and Nov ’17 testing (see below). NOTE regarding pasta, tomato sauce and tomato paste amounts: if use low end of range for pasta, use low-end for tomato sauce and paste; if use high end of range for pasta, use high-end for tomato sauce and paste. Or split the difference for all 3 (5 oz or 45 g pasta, 1¼ cups tomato sauce and 2½ Tbsp tomato paste). Pasta Layer: Cook pasta according to directions, but remove from heat 2 – 3 minutes less than directions; drain. Return pasta to warm, drained pot. Stir in beaten egg white, optional milk/cream, and feta. Set aside. Meat Layer: Meanwhile, chop the onion, mince the garlic, and set aside. Cook the ground meat in skillet, half at a time, until meat is browned. Add onion and garlic to the second batch of meat. Drain off fat, then return all meat to the skillet. Stir in wine, tomato sauce, oregano, salt, pepper, cinnamon and nutmeg. If you like a tomato-y sauce, you can add tomato paste to taste. Bring to boil, then simmer, uncovered, for 10 minutes or until most of the liquid is absorbed. Taste and adjust seasonings; you should just be able to taste the cinnamon and nutmeg. Cool slightly. Béchamel: Meanwhile, prepare Béchamel: Melt butter in medium saucepan. Stir in flour, salt and pepper until well blended and cook a minute over medium heat. Stir in milk all at once, vigorously stirring to keep flour from clumping. Cook and stir until thickened and bubbly. Add nutmeg and stir well, then cook one minute more. Blend a moderate amount of hot mixture into beaten egg yolk in a glass measuring cup or small bowl. Stir back into saucepan and stir in the cheese. Remove from heat. Assembly: Preheat oven to 350°F. Arrange half of the pasta mixture in baking dish. Spread meat mixture over pasta, then remaining pasta, trying to keep layers even. Pour hot Béchamel over all, and smooth out with a rubber spatula. Poke about with a fork so that some of the Béchamel will seep into the casserole. To serve: cut into squares or rectangles. If desired, sprinkle with snipped fresh parsley as a garnish. 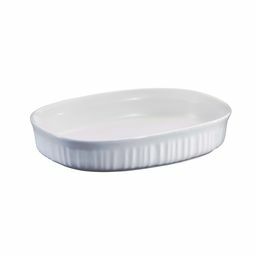 Another option for me is to use my oval French-white Corning Ware baking dish (photo, right), which is only a little smaller than a 9″ square pan. I can use the 9″ square recipe, then after using 1 serving, I can transfer the remainder to my 6″x8″ pan for storage. 10/14/17: I used ⅔ cups (about 54 g) Ziti pasta, measured dry; 1 small beaten egg white; 1 ½ Tbsp whole raw milk; and 2 Tbsp grated Parmesan/Romano cheese mix (I was out of feta) for the pasta layer but this was only enough pasta for one layer, and it was too runny. I increased the ingredients for the tomato sauce (except used original 4 oz of lamb), and Béchamel sauce as updated in the 6″x 8″ recipe above. Instead of layering the pasta and tomato sauce, I mixed them together for one layer, then spread the Béchamel over. I updated the ingredient amounts for 9″ square and 6″x8″ sizes for all layers accordingly. [Those for 9″ square size are roughly ⅔ – ¾ the amount for full recipe (9×13 size), and those for 6″x8″ size are roughly ½ the amount for full recipe (9×13 size)]. Result: Very good, but I had used the original lesser amount of lamb, and would have preferred more lamb (for taste and protein). Next time: Use 1 jumbo egg, separated; use more lamb (6 oz for the 6 x 8 size). 11/7/17: Made as updated, using 6 oz (175 g) pasta; at first, it seemed like it was too much, but that could be because 1 cup tomato sauce plus 2 Tbsp tomato paste was not enough (1½ cups sauce plus 3 Tbsp tomato paste would be better). Also used 2 small eggs because my large eggs are not really ‘jumbo,’ and 2 Tbsp milk for the pasta. Otherwise as written per previous testing, using 3 Tbsp feta cheese for the pasta and 6 oz ground lamb. Next time: wither use 4 oz (114 g) pasta and 1 cup tomato sauce, or 6 oz pasta (175 g) pasta and 1½ cups tomato sauce. Result: This is really delicious, but as I said, the pasta/tomato sauce ratio was not good. Half-recipe updated accordingly. 1/18/18: Made as updated using for pasta mix: 112 g mix of whole grain and regular pasta (cooked 8 minutes), whites of 3 small-medium eggs, 2 Tbsp milk and 3 Tbsp feta; lamb and tomato sauce: 7 oz ground lamb, 1¼ cups tomato sauce, 3 Tbsp tomato paste, plus onion, garlic and spices as written for T-sauce; Béchamel: ¾ cup milk, yolks of 2½ of the small-medium eggs (saved remaining yolk for my smoothie the next day), 2 Tbsp heavy cream (because sauce was too thick), plus other ingredients as written. Assembly: 4 layers: pasta, tomato sauce, pasta, and béchamel; sprinkled top lightly with cinnamon and nutmeg. Baked in preheated 350 oven 45 minutes. Result: Fabulous! Nice balance between pasta and tomato/lamb sauce. I served with sautéed sliced young zucchini, green beans and grape tomatoes. This version, adapted from The Vegetarian Epicure (2), substitutes lentils for the meat, and adds eggplant for flavor. Information on soaking/sprouting lentils is from Nourishing Traditions (3). Wash lentils, then cover with 3 cups boiling water. Let soak about 7 hours. Or, can sprout them, rinsing 3 times a day, for 2 – 3 days. Pour lentils and their water into pot (or, if using sprouted lentils, cover with water in pot). Add a little salt and olive oil and cook until water is almost gone, about 30 – 45 minutes. Wash eggplant but don’t peel it. Chop into small pieces. Using cast iron skillet, saute onions (see above recipe) in olive oil. Add chopped eggplant and cooked lentils. Add tomatoes, etc as per above recipe to make the sauce. Cook pasta then layer with the tomato sauce as per above recipe. Prepare bechamel and pour over casserole, piercing here and there with a knife or fork. Bake as for above recipe. This variation works well with either of the above versions, and is a great way to sneak spinach into the diet of kids. When layering in the baking pan, add a layer of chopped fresh spinach or chard after the meat layer. Sprinkle lightly with more nutmeg and 1 – 2 cloves of fresh garlic, minced. Then proceed as original recipe, topping with second layer of pasta and then the Béchamel. Serve with Horiatiki (Greek Village Salad), Spinach Pie, Pickled Beets, and a glass of Retsina or other Greek wine. This entry was posted in Alcohol, Baked, Beef, Buffalo, Dairy, Eggs, Fat or oil, Flour, Game, Herbs, Lamb, Leafy Veggie, Legumes, Onion family, Pasta, Sauteed, Simmered, Spices, Vine veggies and tagged butter, cinnamon, egg, eggplant, lamb, lentils, milk, nutmeg, oregano, parmesan, pasta, red wine, retsina, romano, spinach, tomatoes. Bookmark the permalink.